FPMT Translation Services hosted FPMT’s first translation conference at Istituto Lama Tzong Khapa, May 13-20. The conference was very successful with many concrete strategies put in place for establishing a glossary of terms for the translations of texts for FPMT study programs. More than 40 people attended, including Yangsi Rinpoche, with Ven. Joan Nicell and Merry Colony facilitating. 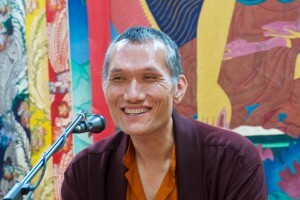 A full conference report is available on fpmt.org. Yangsi Rinpoche offered this sutra-style piece as part of his closing remarks for the conference. Read by Namdrol Miranda Adams. Thus I have heard. At one time, the Bhagavan was dwelling in a pure land somewhere in Tuscany, along with a great community of bodhisattvas. At that time, the Blessed One entered the meditative absorption on the varieties of phenomena called the Appearance of Dharma in the West. At that time as well, the holy Avalokiteshvara, the great Compassionate One, the bodhisattva, the great being, through the power of the mind of the Buddha, beheld the phenomena of the Western Students of the Dharma and saw that though they were empty of inherent existence, they were suffering. The holy Avalokiteshvara, the bodhisattva, the great being, spoke to the Venerable Shariputra and said, “Shariputra, it is true that these sons and daughters of the Buddha in the west have been circling in cyclic existence since beginningless time. It is true, as you say, that they are barbarians, full of greed, attachment, anger, and ignorance. It is also true, as you mention, that they suffer from the mental affliction of conceptualization. But, Shariputra, they will be liberated. “Today, Shariputra, in a small city in the west of Italy, the seed was planted by these well-meaning disciples who gathered together with the sole motivation to benefit the future generations of truth-seekers. They gathered together with the motivation to embark on that most important and noble of activities, to translate the words of the Blessed One, and the great bodhisattvas of India and Tibet, into their native languages, with precision and integrity. They gathered so with pure intention and with good hearts, resolving to work together in concord, with mutual appreciation, without disputing, mixing like milk and water, viewing each other with kindly eyes. “Doing so, Shariputra, these disciples have ensured that the teachings of the Buddha will remain in the world for a long, long time. “Also, Shariputra, by their actions, maintaining physical, verbal, and mental acts of loving kindness towards one another, setting aside their own wishes with a mind intent on benefiting all, and recalling the lack of inherent existence of every action, they have made the Dharma manifest in the west. At that moment the Buddha arose from his meditative absorption on the varieties of phenomena called the Appearance of the Dharma in the West. “Excellent, excellent,” he commended the bodhisattva, the great being. “It is just so, it is just so. All those who wish to practice the Dharma that I have taught, should do so exactly like that. Thereupon the Venerable Shariputra, the holy Avalokiteshvara, the bodhisattva, the great being, and the entire assembly of bodhisattvas all rejoiced and praised them, as the Blessed One had said. An extensive article on this conference can be found on page 30 of Mandala October-December 2011, print edition.